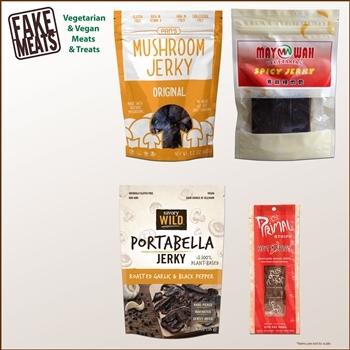 A collection of the most popular flavors of vegan / vegetarian mushroom jerky available on FakeMeats.com! Love mushrooms, and searching for your new favorite vegan jerky? This jerky combo pack is just for you! Buy this jerky combo pack to try all the the most popular mushroom jerky! Also a great gift for that special person in your life! *We frequently add new jerky to FakeMeats.com. Check the jerky section to see all available veggie jerky.